Last weekend I visited one of my uncles. Ask any Nigerian, our filial culture provides us with an infinitesimal number of uncles. Among my uncles, this one stands out as my role model, and as one person instrumental to the vast computer knowledge, I have. The lovely picture above shows a desktop PC currently running Windows XP, with a whooping 256 MB of RAM (LOL!). The hard drive size has skipped my memory, but its most likely less than 50 GB. The processor speed is about 220 MHz. I don’t even think it has been used in the past two years. Enough of “yabbing” my PC. 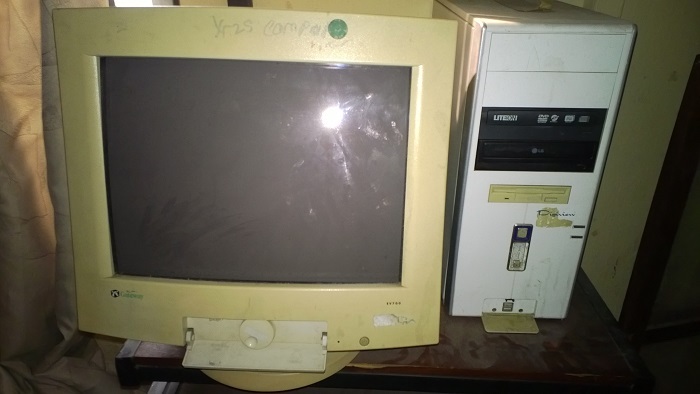 It was my practice computer from primary school, to secondary school, and up until my second year as an undergraduate. It diligently served for a decade. Imagine that! Back when I was in primary school, computer education was just finding its feet in Nigeria. Luckily, I attended a private primary school that offered computer studies. So, like the rest of my schoolmates, I was introduced to the world of computers—theory sessions in the class, and practical sessions in the “computer room”. The computer room had only one desktop PC, and the computer teacher had to take each class of about twenty-five students at different times to the room. Like Oliver Twist, I was not satisfied with the little public time spent in the computer room; I wanted more! Luckily for me, my uncle had a spare PC in his guest room. Back then, it ran Windows 95. Whenever my siblings and I went to his house for holidays, we were allowed to use the PC, doing whatever entered our vernal brains. I still was not satisfied with the holiday time. Seeing my zeal, from Primary 5, when I was about ten years old, my parents allowed me to make the twelve-kilometer journey to his house, unaccompanied, so I could indulge my hunger for computer exposure. Thanks to that opportunity, I gradually gained experience in the use of computers. My secondary school also helped a lot. Some of the folks I met there were really computer aware. I opened my first email account while in JSS 1 (It’s not a big deal now, but it was back in 2002), and that account is still in use today. On several occasions, I joined other colleagues to leave the school without permission in order to use the PCs in cyber cafes (I wasn’t a “bad boy” though). It was all about spending more time with computers. From the backwaters of an archaic computer, I’ve really stepped up. My phone has four times that desktop’s RAM, while my laptop has over 32 times the RAM, over twenty times the hard drive size, and a processor speed that far exceeds the desktop. However, without my uncle’s PC, there may not have been a “Mr. Fix It”. I may be using much better devices now, but without that “archaic” desktop, I would still be like the legion of persons who cannot use a PC for anything other than typing poorly formatted documents (and watching movies). Today, I look back at the “days of humble beginnings”. With a vast computer experience and creativity, I dazzle people with my computer skills. Little do they know, that it’s all from a 256MB desktop computer.